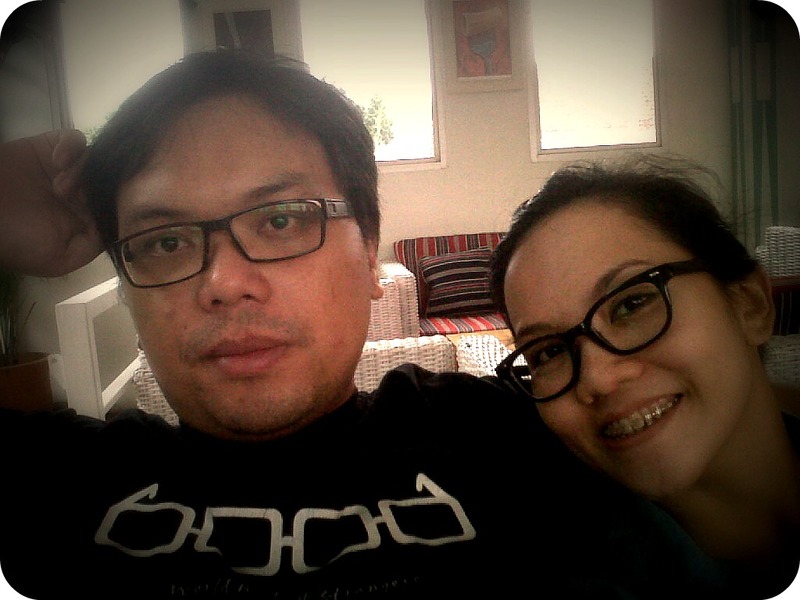 We're actually in Bali today and for days we've been very excited to go on holiday here. No more Journal reading and Thesis/Dissertation writing for five days and Aswin said maybe we will have a revelation there, but yeah we still worried about our research. Ok forget about it. So, we kind of recapping our previous writing about culinary in Bali. So, for a few days it will be all about Bali in Jejakrasa. First, it's about Nasi Campur Bali, well we don't have many pictures but we've got some information about it from our friend, Ari Mardawa who currently reside in Bali. 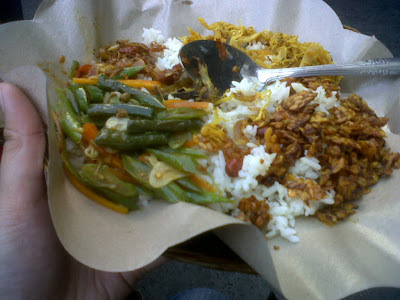 For some people they prefer this nasi Bali, more spicy and more Bali like. 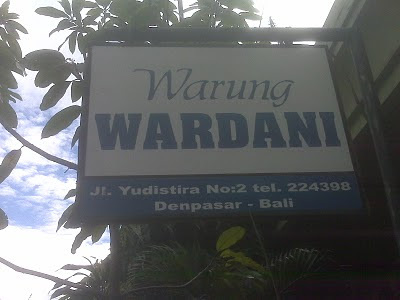 The price is cheaper than Warung Wardani around Rp.20,000,- We also went here in 2009 and my friend from Bali, Ari Mardawa or we called him AMK who treated us the meal. Yeah, it also tasted good, but what I remember also from the trip to this place was someone throw up in front of our table. Not a good sight but it was unforgettable memory. Based on the list given by my friend, in Satria area has been well known for its Warung Nasi Campur Bali: Wardani, Adnyana, and Satria. The oldest one is Satria and Adnyana with the taste of Bali, while Wardani has mixed with taste from Java. 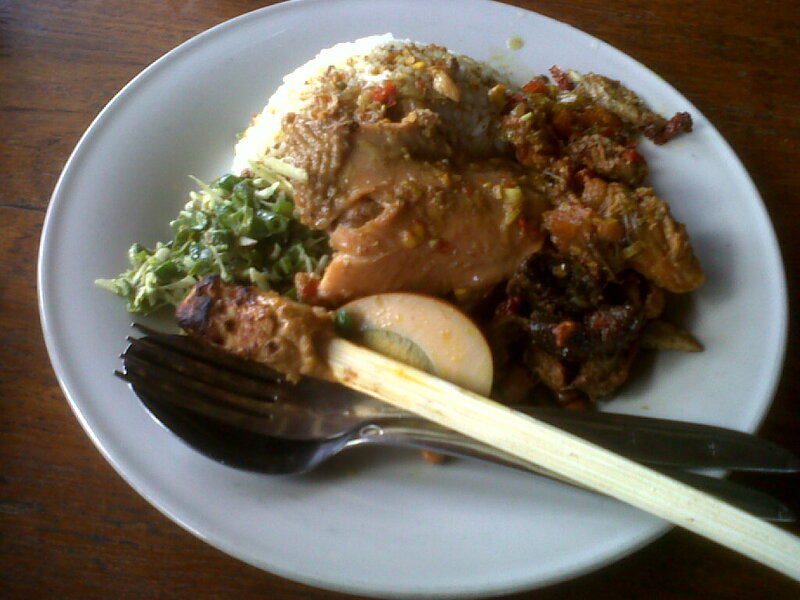 The third one, Warung Satria is located on Jalan Kedondong. The very well known Nasi Pedas in Bali. 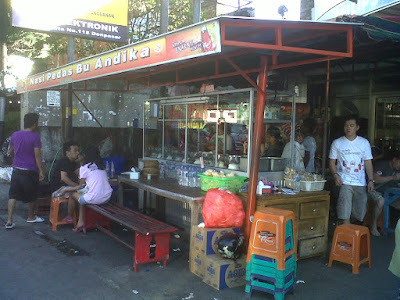 It is located near Joger Shop and stall is in front of store, so basically it's street food. I always went there, every time I came to Bali. On high season, the place is crowded and sometimes you eat without table. The special one is the chicken skin, it's spicy and crispy. The price range is around Rp. 12,000 - 25,000,- Last year when I went to Bali for research, the first place I visited after I landed in Bali was this place. Still good and can't wait to go here again this time but beware of the beggar that walking around you while you are eating, it is annoying and not a pretty sight. I went here to have lunch with Monike, one of my partner in the research team. We had to go to government office in Gianyar and also Neka Museum, so at lunch hour we asked the driver to take us to this nasi Kadewatan, which was quite far from Ubud village. But it was worth it, the rice was delicious and I will go there again. So, based on the information on the internet, this vendor also have the branch in Denpasar and Petingenget area. It was only opened from 7 am till 9 am. The rice is kind of spicy and good, also you have to be patience with the queue. And many tourists after try this rice become fans and always come here when they are in Bali.